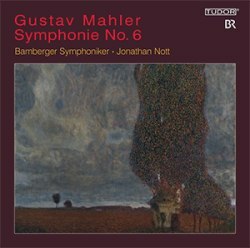 I had intended to do a double review of the Sixth and Eighth symphonies, the latest instalments in Jonathan Nott’s Mahler cycle, but after careful reflection I realised it was best to assess them separately. I’ve only heard his recordings of Nos. 1, 2 and 3 and his 2013 BBC Prom of No. 5. The good news is that his ‘Resurrection’ is one of the finest of recent memory (review). Taut, cogently argued and superbly dramatic it’s everything this symphony should be, but rarely is. The bad news is that there’s a huge gulf between that and his First, which suffers from ‘too many lapses of judgement and ensemble’ and his Third, which is ‘crippled by the kind of expressive liberties that give these symphonies a bad name’. That sounds pretty harsh, I admit, but then this is a hotly contested field with many fine versions of these symphonies to choose from. That said, few complete Mahler cycles are consistently inspired; I much admired David Zinman’s Tonhalle series for instance, not least for its liberating vitality and freshness, but that initial enthusiasm dwindled from No. 6 onwards. One set that has few if any serious weaknesses is Michael Gielen’s clear-eyed traversal with the SWR Baden-Baden und Freiburg (Hänssler). If anything his live Testament Seventh with the Berliner Philharmoniker (review) confirms the musical and sonic virtues of the Hänssler series. In fact I’d go so far as to say that if you were to own just one set of these symphonies - the box is complemented by a fine Tenth, recorded later - then this must be it. Given that sustained quality is rare in these works it would be short-sighted of me to dismiss Nott’s cycle on the basis of two disappointments - three, if you include his Proms Fifth. So what of his Sixth? While there’s plenty of energy in the Allegro the downside is that dramatic tension is soon compromised by a certain doggedness, and the wild-eyed nature of this movement is persistently underplayed. Also - in stereo at least - the recording sounds very close, and the soundstage is rather narrow. Still, the detail in the more spectral moments is superbly rendered; what a pity, then, that Nott’s reading is so detached, the music’s grim tread so unthreatening. So, not an auspicious start, and anyone used to the rugged terrain of, say, Boulez and the Wiener Philharmoniker (DG) will be disappointed to find themselves stranded on a gently undulating plain. Stranded is the operative word, for there’s no prospect of a quick rescue here or in the ensuing Scherzo. I’m always perplexed by readings of this symphony that so comprehensively miscontrue its darkly compelling centre; as if that weren’t dispiriting enough Nott’s rhythms are inflexible and his tempo relationships are too arbitrary for my taste. Indeed, the musical and emotional polarities embedded in this music are conspicuous by their absence. This is all the more distressing as the Bambergers play very well, especially in the Andante. Thanks to a barely discernible pulse Nott manages to strip these lilting tunes of their gentle charm. Just sample the recent RCO DVD/Blu-ray with Maazel and you’ll hear this music breathe and bend in the most delightful way (review). Therein lies the rub; the artifice that distracted me so in Nott’s recordings of the First and Third - and his Proms Fifth - trivialises the Sixth's bleak narrative. Occasionally there are absorbing paragraphs, but without a proper, overarching context these are apt to seem like a series of non sequiturs. In mitigation Nott does capture something of the 'tragic' nature of this piece in the Andante, only to lose it at movement’s end, where it all becomes so flaccid. That same lack of power is evident in the Finale - just listen to those frankly risible hammer blows - whereas Boulez and his Viennese players are simply terrifying in their intensity and amplitude. Enigmatic and infuriating by turns, Boulez’s Mahler seldom makes me sit up and take notice; in that WP Sixth he has my undivided attention, which is more than I can say for Nott’s much too tentative account. In an earlier review of one of Nott’s Mahler recordings I left him flailing in the foothills, the distant summit well beyond his reach. However, despite so many false starts I’d hesitate to consign him to Room 101; indeed, anyone who can give us such a remarkable ‘Resurrection’ deserves more chances than most. A seriously disappointing Sixth; perhaps Nott will redeem himself in the Eighth.